If you have any questions and you cannot find the answer below or elsewhere on the website please feel free to contact us using our on-line form and we will endeavour to return any queries as soon as possible. My child has been ill, should I still bring them to lessons? Children should be fit and healthy on the day of their lesson. If your child has been suffering from sickness or Diarrhoea then they should NOT enter the water. When will my child move up a class? Children are continually assessed by the teacher. If the teacher feels that they are ready to move up a group then they will be moved straight away. You will not have to wait until the end of the term. How long do lessons/courses last? Lessons are 30 minutes each. Our termly swimming courses, with one lesson per week, are the same length as the school term so they fit neatly around children’s holidays. All you need is an appropriate swimming costume or trunks, towel, goggles and swim hat are optional. Oh and the only other thing you’ll need is……. your smile!! What age does my child have to be? We start swimming lessons from the age of three. My child already has swimming lesson at the swim school, do I need to register again at the beginning of next term? 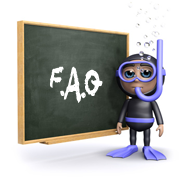 Only new swimmers need to register to swim, just turn up at the beginning of the next swimming term and continue with swimming lessons as usual. When will my child get their next badge? Badges are awarded to swimmers when they are able to repeatedly demonstrate the skills required for that badge. There is no defined time scale. As we all know, all children learn and develop new skills at different speeds. My child can't attend next term, can you save their place? Can I change my child's lesson to another day? Everyone is different and it really depends on what you want to achieve. Even after just one course, you should be able to see a vast improvement in water confidence and swimming technique. How many children are there in one class? Our aim is to have no more than eight pupils in a class to ensure our teachers are able to give each pupil the individual attention they deserve.